During the early 1950s, a time when British artists had limited exposure to the latest painting from America, Davie earned the reputation of being the nearest thing in England to an American Abstract Expressionist. For Davie these artists captured the dynamic energy needed to stimulate a new growth in painting. He wrote: ‘This was a time when creative people in all the arts were striving for a “liberation”…a setting free of the natural pictorial flow of letting go – we had a vague notion that complete freedom would lead to infinite possibilities’ (Alan Davie, letter to Jeremy Lewison, March 1997). Davie first encountered the radical forms of abstraction coming out of New York in 1948 when he and his wife took up a deferred art school travel scholarship and set off around Europe. Unlike other British artists who made straight for Paris and stayed there, Davie went to Paris but then ventured further afield. His experiences in France, Switzerland, Italy and Spain were transformative. After hitchhiking to Switzerland and walking around the Matterhorn, the Davies went to Venice. Their arrival coincided with the 1948 Biennale, the first after the war, in which Peggy Guggenheim displayed her collection of Surrealist and contemporary American art in the Greek Pavilion. Davie spent five consecutive days at the exhibition and was introduced to and inspired by the work of Pollock, Motherwell and Rothko. While in Venice he also met the legendary patron herself. Guggenheim saw a natural affinity between Davie’s work and certain American action painters. In a letter dated January 1949 she wrote: ‘In Venice I discovered a young Scottish painter who works like Pollock. It is funny to be influenced by Pollock instead of Picasso. That just shows how time is marching on’ (Peggy Guggenheim, 16th January 1949, Archives of American Art, Smithsonian Institution, Washington). She purchased Music of the Autumn Landscape of 1948 and became a good friend and important early supporter of Davie. This trip reinvigorated Davie and on his return to London he took up painting with renewed zeal. For him artistic merit had little to do with either skill or technical accomplishment. Good colour did not come from the use of lovely paints, or beautiful line from an elegant brush or a finely controlled point. Like Pollock, the post-War giant of Action Painting, in the early 1950s Davie took to the floor, approaching his canvases from above and exuberantly attacking them from all sides. This move also signals a change in scale of the paintings which would increase through the 1960s. The act of painting was now inseparable from the dreams of grandeur that demanded large gestures and large canvases. 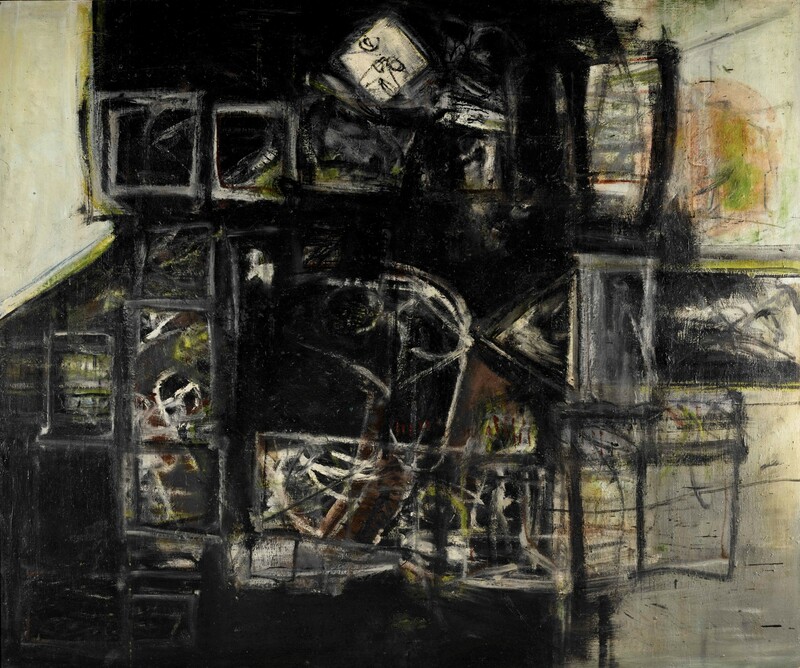 Although his works of the 1950s and '60s are very clearly of this time and share much of the gestural determination of his transatlantic contemporaries, Davie never considered himself to be part of a particular movement. Rather his objective was a search for a formula for the magical conjuring of the unknowable. Influenced by the Surrealist strategy of automatism, Davie began his canvases without a predetermined idea, allowing him to tap into unconscious imagery. He put his faith in the gift of improvisation that had made him a good jazz musician; he painted swiftly and violently, responding to flashes of inspiration. The Entry of the White Diamond was executed in 1955 when Davie’s work was receiving well deserved recognition. 1957 saw his first exhibition in the United States at the cutting-edge Catherine Viviano Gallery in New York and the year after he had a solo show at the Whitechapel Art Gallery in London. The present lot is a visceral painting, executed with wild, turbulent brush strokes. Piercing whites, reds and yellows emerge from a black background. Black had a special meaning for the Artist following a brief illness in 1946, during which he was temporarily blind. He described this traumatic visual experience as whiteness: in contrast, black came to signify the depth of life. A dazzling white diamond surmounts a complex of squares and rectangles. The diamond shape had been present in Davie’s vocabulary of symbols for several years, and became one of his obsessive symbols. These did not convey any specific meaning; instead, Davie viewed them as primordial signs which have many and varying meanings at different times. Majestic in both scale and sheer energy, The Entry of the White Diamond is entirely illustrative of this moment in time, of a painter working at the top of his game. Alan Bowness, Alan Davie, Lund Humphries, London, 1967, cat. no.76.